The exhibition preview is a curious convention. Though press previews make plenty of sense, the logic behind setting an exhibition start date and then opening one night earlier seems less clear. Let’s be honest, the purpose of attending an opening is rarely to enjoy the art (which will be on display under more conducive conditions for the rest of the exhibition’s run), and many artists and artworld professionals bemoan ‘having’ to go to them. I am of course being disingenuous, however. We all know the main reason why the preview exists: it’s an opportunity to socialise, network and, perhaps most enticingly, enjoy a free beer or glass of wine after work. But what if, like artist Lubna Ali, you don’t drink? Ali is relatively unusual within the British contemporary art scene in that she is a practicing Muslim. Not only does this mean that she does not consume alcohol, but also that her faith councils her to avoid being around it – yes, even if there is a token jug of orange juice somewhere in the vicinity. Just as in art school, where the pressure to attend life drawing classes (a distinctly Western tradition) conflicted with the Muslim diktat against representing the human form; her lived experience of what is held up to be a ‘liberal’ space, aware and welcoming of diversity, continues to be shaped by degrees of marginalisation. If your ‘too lefty’, ‘too liberal’, ‘too politically correct’ alarm bells are beginning to sound, hold on. Whether intentionally or not, the opening of Ali’s own exhibition – My Show, My Rules (30 Jun-11 Aug) at PAPER – served as a neat social experiment, perfectly demonstrating how far we have to go before reaching that threshold. 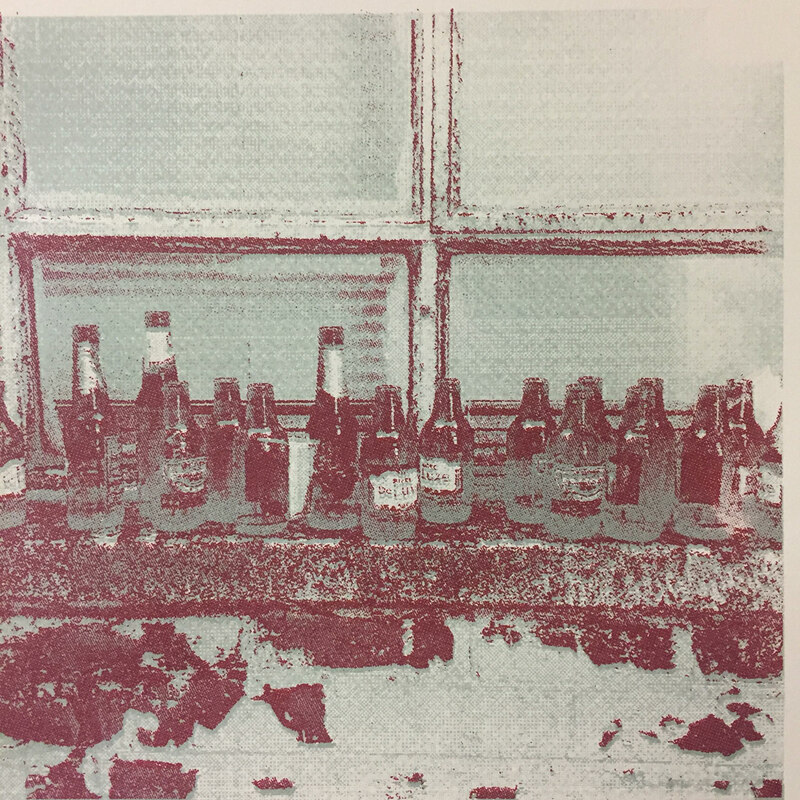 The exhibition itself consists of a paired-back series of quietly emotive screen prints based on photographs of empty beer bottles and wine glasses, which Ali took during moments of feeling side-lined at past previews. Following the themes of the show and the defiant spirit reflected in its title, she decided to flout the art world’s golden rule and open in the absence of alcohol, providing a range of luxury cordial-based drinks in its place. Tellingly, these didn’t go down so well and a few resourceful guests found their way to neighbouring PS Mirabel’s fully stocked bar instead, leaving the empties dotted around the gallery and its exterior. Art imitating life; life imitating art. This is not the first time Ali has addressed tensions between cultural identity and the art world in her work. Shortly after graduating from the University of Salford in 2017, she undertook a six-month residency at the Whitworth where she and fellow artist Matilda Glen worked closely with the WYC (Whitworth Young Contemporaries) youth collective on a project to engage more young people belonging to the South Asian community from the surrounding areas of Rusholme, Moss Side and Hulme with the gallery. As Youth Engagement Coordinator Sally Thelwell explained: the Whitworth “often struggles to get young people from these communities to come to our events or to visit the gallery” – despite it being on their doorstep. Discussing the project, Ali recounts that the main reason that the ‘young people’ she worked with gave for their lack of engagement was that they felt the gallery wasn’t “a place for people like us.” The reasons behind this feeling of exclusion and the solutions to it are complicated, but needless to say, they don’t reflect well on the art world, which is still largely divided by lines of affluence and race. Taking a step back, however, and refocusing on Ali’s wider practice; she describes her main artistic aim as being “to refresh the current narrative of British Muslim identity by openly discussing the issues affecting the Muslim community.” This intention manifests itself in an intriguing way through her enigmatic use of pattern – based on a fusion of her interest in Western minimalist art and engrained knowledge of traditional Islamic geometry. The repeating designs that overlay her prints perhaps reflect on the multiple layers of any situation and how stopping to seek these out can provide another, perhaps richer perspective on the world around us. Whilst bold in its aims and approach, Ali’s work is subtle and demands time to be read. Do not mistake her prints simply for attractive objects to be hung on a bedroom wall; these are deeply personal statements about life, art and personal-identity. Listen to them carefully and locate your own place in their world. Ali’s work is also currently on display until 14 October 2018 at Salford Museum and Art Gallery as part of PRINT UnLtd. – a group exhibition featuring four North West based artists whose work sets out to challenge and question perceived constricts and rules around printmaking.